A fire spreads very rapidly, In two minutes a fire can become life threatening, please make sure your family or business has a fire drill and evacuation procedure, and to check smoke detector batteries regularly. In Five minutes a small ember can fully engulf a home, And before you know it, your familiar surroundings are dramatically changed. We work quickly and efficiently with your insurance company to start reconstruction rapidly and get you back in your home or business. Even a small fire can be devastating, leaving your house vulnerable to natural changes in the weather. We make sure no further damage is done by responding immediately. Fire Damage Restoration even with short notice, All of our highly trained technicians are on call 24/7 to respond now. It is important to know that intense heat and smoke can be just as harmful to you, the homeowner, and the home itself. We clean and restore without using toxic chemicals to ensure a safe indoor environment for Children, Guests, and the pets as well. 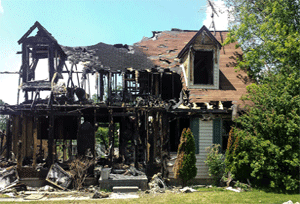 Get your Fire Damage Restoration quote to your insurance company as soon as possible.